The Irwin Tile and Porcelain Drill was sent to us as part of our tool reviews series in order to see if this drill bit was as effective through ceramic tiles and porcelain tiles as a normal masonry bit. We examine the quality of the drill bits and their effectiveness at drilling through tiles without damaging the rest of the tile. It was a pleasure to do this tool review as this drill bit simply glides through ceramic tile. It is sharp, strong and very effective. Using drill bits on ceramic tiles is easy with this tool. These bits do not slip, they will drill through wherever you place them and they will do it quickly. You can see from the video that little pressure was placed on the drill itself. This is a huge advantage as it means the drill bit is very sharp and minimises the possibility of tile breakage through pushing hard down on the drill. We would recommend placing the drill on a speed of no more that 300 revolutions per minute and dropping a little water on the tile to keep the drill bit cool. This allows maximum efficiency and makes the drill bits last much longer. Never put the drill on hammer even when using these drill to go through porcelain tiles no matter how hard they are. We did not do a test using these drills to drill through porcelain as it can usually be gauged how easy this will be from the way they drill through ceramic. If you are interested in purchasing these drill bits or would like to find out a bit more then check out our superstore. The result is that we would have no hesitation in using these drills for drilling into ceramic tiles and even porcelain, albeit with a little more effort due to the density of porcelain tiles. 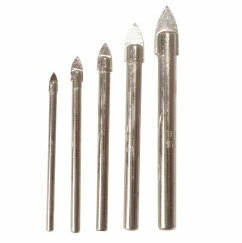 The drill bits themselves are sharp and accurate and can be used effectively on low drill speeds. With this in mind we are more than happy to award these bits 4 stars for their performance.